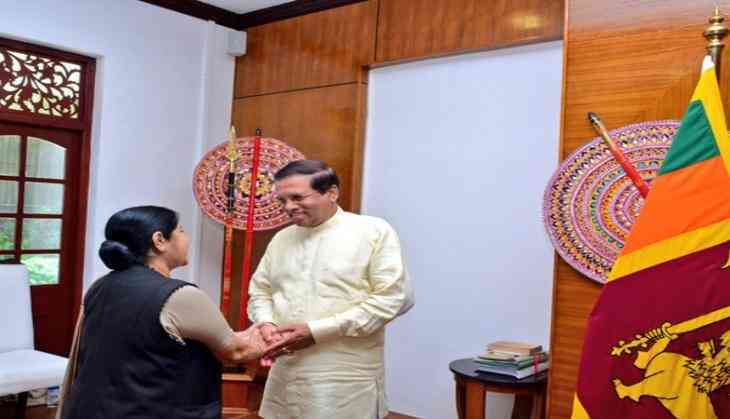 Indian External Affairs Minister Sushma Swaraj on 1 September met Sri Lankan President Maithripala Sirisena in Colombo and discussed bilateral issues of mutual collaboration and issues related to regional cooperation. Indian External Affairs Ministry spokesperson Raveesh Kumar confirmed this and tweeted: "Meeting with the leadership... discusses bilateral issues of mutual collaboration." Sushma Swaraj also met Sri Lankan Foreign Minister Tilak Marapana and discussed "bilteral cooperation and partnership for progress & prosperity". Cooperating across the political spectrum, Leader of the Opposition R. Sampanthan called on the Indian minister Swaraj. As a goodwill gesture, Sri Lanka released seventy-six Tamil Nadu fishermen, arrested by the Navy for allegedly fishing in the island nation's territorial waters. Sushma Swaraj arrived in Colombo on 31 August on a two-day visit to Sri Lanka to attend the Second Indian Ocean Conference. The first edition of the Indian Ocean Conference was held in Singapore in September 2016. The two-day conference is being jointly organised by the India Foundation, the S. Rajaratnam School of International Studies (RSIS), Singapore and the National Institute of Fundamental Studies (NIFS), Colombo.